Crownbrush are a 30-year-old business that is the European distributors of the Crownbrush brand. 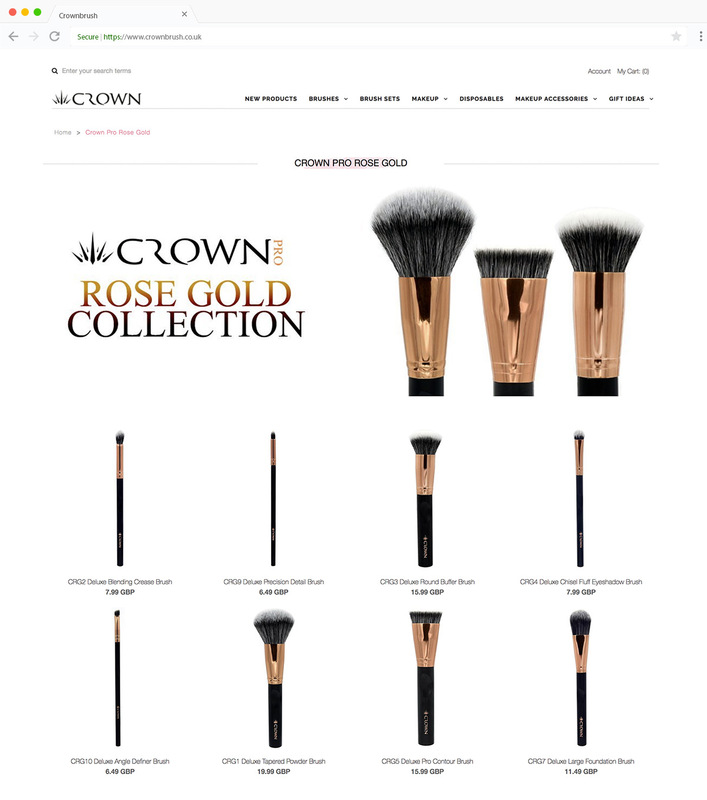 The previous online store was powered by Magento but due to SEO implications, not being responsive, and the requirement for growth of online sales, Crownbrush looked to work with our agency to move their website to Shopify Plus. Whilst considering Magento 2.0 the company realised that not only was Shopify Plus a comparative platform, but it could also save both development and ongoing IT costs. 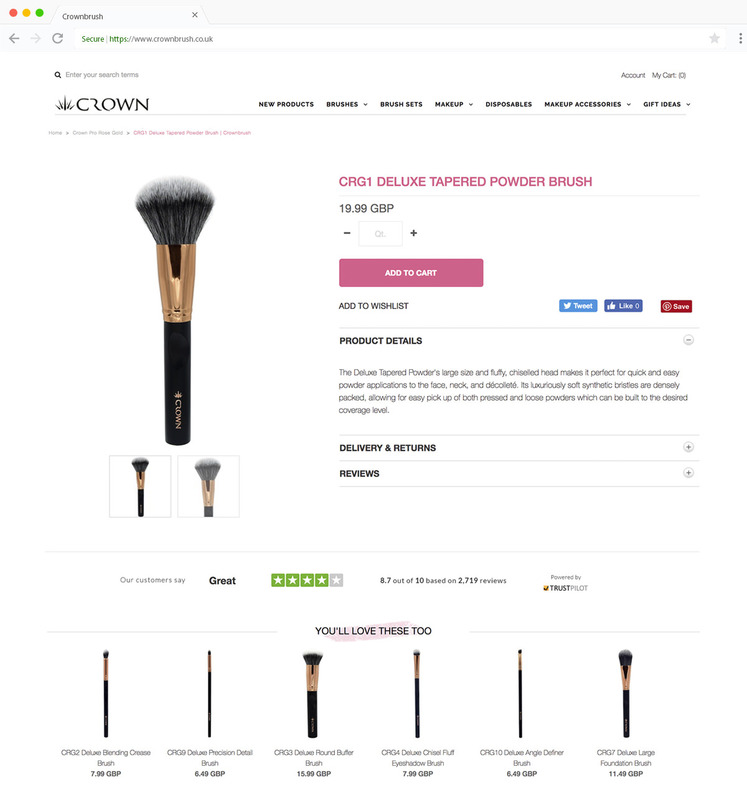 The beauty industry is a highly competitive market and Crownbrush needed a new online store that could stand alongside to the large players. The company wanted to make sure they were seen in the best light online with a fresh new look and features required that were previously not possible or too expensive to integrate on the Magento platform. With a fast launch being essential, Crownbrush chose our adaptable team who could react quickly whilst keeping a personal touch to our approach, all alongside a scalable platform that took away the headaches of IT management. Our team worked with Crownbrush to redesign the online shop and develop it with the various integrations required to support their growth. Shopify Plus features were fully utilized to give the team the functionality required, with bespoke Shopify Scripts developed to customise the customer checkout experience. All the previous stores data was successfully migrated from Magento to Shopify, with features such as live chat, instant search and wholesale abilities integrated. The store was also internationalised to allow unique experiences to take place for their UK and EU customers. To make management of the store simple, a stock synchronization system was integrated as well as a backend inventory management platform to make managing products and orders across the different international stores simple.